Whether you’ve caught them busking around town or on a festival stage somewhere, there’s little chance you weren’t moved to dance to King Porter Stomp’s energetic blend of jazz, hip hop and ska. The Brighton big band are back on the road this month, stopping off at the Synergy Centre on the 23rd for a headline show alongside scratch DJ extraordinaire JFB, DJ Detta and local rap collective Along Came Shifty. 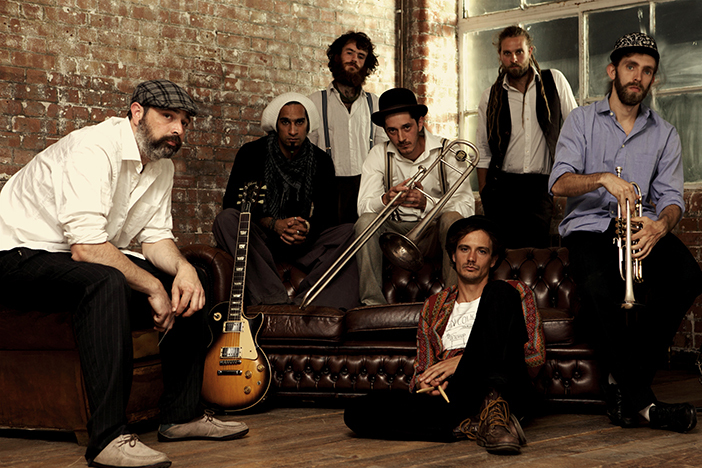 After the laidback vibes of 2012’s record ‘Shuffle’, KPS returned earlier this year with a new album full of conscious state-of-the-world lyrics backed by urgent upbeat ska. A couple of line-up changes probably helped revitalise the band, but it was politics that provided the spur. It’s testament to the band’s songwriting verve that themes like this can sit happily with the sort of music that’s irresistible to dance to. It’s even possible that the lyrical element is what makes a King Porter Stomp gig so joyous; positivity in the face of ceaseless bad news makes it mean so much more. Of course, the blazing horns certainly help.